There were some similarities between last year’s MLS Cup final and the rematch the defending-champion Sounders played Saturday at home against Toronto FC. For one, the day’s lone tally came via a penalty kick in which Roman Torres played a key role. Also, another left-handed stop was made by Sounders keeper Stefan Frei off Toronto striker Jozy Altidore to give his team a fighting chance. Apart from that, though, the Sounders didn’t do enough to keep their 14-game unbeaten streak at home from ending in a 1-0 defeat to last year’s finalists on a rather lackluster afternoon. Indeed, the Sounders again controlled the ball more than 63 percent of the time and had a dozen shots – eight of them from inside the 18-yard box. But to the mounting frustration of 41,468 fans at CenturyLink Field, they again struggled to finish. The only time they found the back of the net came in the sixth minute, when Jordan Morris headed a ball in behind Toronto keeper Clint Irwin following a Cristian Roldan free kick. Alas, the play was ruled offside because Gustav Svensson had broken in behind the defenders early, causing a distraction and impacting the play despite never touching the ball. The Sounders’ players went ballistic in protesting, as did the incensed crowd. But the call stood. But on a team held scoreless at home the first 75 minutes last weekend before salvaging a miracle draw, any goals denied aren’t helping the frustration level. The Sounders, now 2-3-4,have fallen behind in all but two games and wind up having to push players forward while opponents capitalize on counterattacks. Toronto, now 5-1-4, entered this finals rematch minus key offensive stars Sebastian Giovinco and Victor Vazquez, as well as center back Eriq Zavaleta. But they grabbed the lead in the 23rd minute when Torres – whose goal in the MLS Cup penalty-kick round clinched the championship last December – barreled over Toronto striker Altidore in the box. 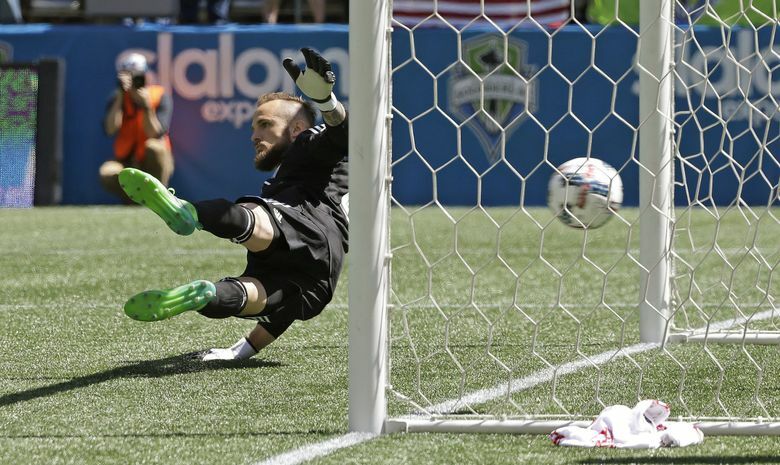 Altidore was awarded the penalty kick and cleanly beat Frei to his left after the keeper dove right. It was a measure of revenge for Altidore, stopped from in close by Frei’s iconic hand save in extra time to keep December’s championship scoreless. Much like that stop, Frei on Saturday got his left hand on a 40th minute drive by Altidore and also deflected it over the crossbar to keep things 1-0 entering the half. But unlike last year’s title match when the Sounders retreated into a defensive shell, this time it was the Reds doing the same once provided the lead. They dropped players back throughout a chippy-looking second half and limited the Sounders to a handful of chances. Bruin said he was man-marked all day by Toronto defender Jason Hernandez, who kept “hugging’’ him whenever he entered the box. As a result, Bruin had arguably his quietest day yet for a Sounders attack needing more noise. Frei had warned heading in that his team had to focus on present goals and not get caught up in MLS Cup rematch hype. He insisted afterwards the team continues to show signs of regaining a championship level, except for the whole finishing part. And with two more road games upcoming, they’ll need to show that resolve again. Preferably sooner, rather than later.